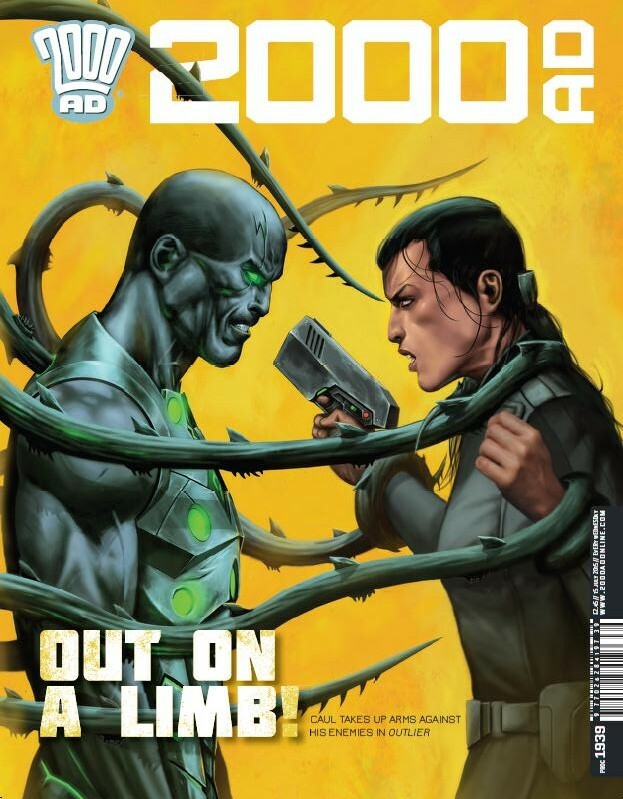 With a couple of thrills coming to an end, and others most of the way through, how does this week’s 2000AD shape up? The challenge that this presents is whether it’s worth picking up when you have pretty much no idea what’s going on. I’ve really enjoyed this tale of the Emerald Isle from Carroll and MacNeil. Like all the best Dredd, it’s social commentary; although perhaps the black comedy has been downplayed in this storyline, it’s still been successful. Despite being the end of the tale (with a satisfyingly violent gunfight), it opens plenty of new avenues, as well as leaving a couple of questions teasingly unresolved. It’s a good taste of what Carroll and MacNeil have to come, and worth getting your head around before we return next prog to Mega-City One and the continuation of the Enceladus storyline. Now with return of the disgraced former Chief Inspector of Her Majesty’s occult investigators, brought out of “retirement” by our cantankerous, cancerous hero Harrry Absalom, you’d expect things to start getting pretty messy in this issue. However, instead, what we get is some really well-written exposition. If you’ve missed the story so far, you’re brought up to speed – if you’ve been following, it lets you see where the different threads have been going. It’s a neat trick, effectively written with edgy art that got more than a touch of MacMahon to it. I can’t wait till next issue, when we get to see them giving them a proper kicking in the “clockwork slags”. With any new thrill, you’ve always got the burden of comparison. Sometimes, like ‘Survival Geeks’ (most recently seen in the Summer Special) even the normally-reliable Rennie swings and misses. Here, though, Edington and D’Israeli distinguish themselves not only through the stylised art that nestles between Ghibli and Hergé but with a thrilling chase and classy homages to a raft of early sci-fi. There’s a distinct feel of Victoriana about this, and with dashes of Jules Verne it creates a good romp as our cop and “mad” scientist make a breathless escape from their captors. It also sows a interesting seed – with a world below, a barrier realm shrouded in poison, and a world floating above, what other realms lie beyond? Outlier is hard graft. It’s a distorted game of sci-fi cat-and-mouse; I’m 5 parts in and I’m still not sure who to sympathise with. This is not a negative, however. What Outlier manages to do, with its searing, cinematic art, is show how effectively 2000AD showcases the range of sci-fi talent that’s out there. You can tell that this is a writer who’s writing for an old-school audience: this is one for the Moore and Morrison fans out there. As PI Carcer and Colonel Luthra try to contain the threat posed by Caul, the alien-modified enemy in their midst, we’re left wondering which why to turn in this dizzying spectacle. Not for the faint-hearted, and not to everyone’s taste, Outlier pushes the boundaries of high-concept sci-fi. I am such a sucker for Jaegir. Daughter of the most notorious general of humanity’s future civil war, on a quest that’s somewhere between redemption and loyalty – showing, as Rogue Trooper has always done, the futility of war and the human capacity for inhumanity. I’ve got to mention the amazing colouring of O’Grady once again here, perfectly matching the mood and time of the narrative, and complementing Coleby’s fantastic, dynamic art. It effectively draws us deeper into the mystery suggesting something far more sinister is at work in the Kashan, the brutal elite regiment that Jaegir and her team are investigating. There’s a neat twist in the last frame which I won’t spoil, but it does illustrate that 2000AD can be a comic for Adults without resorting to prurience. It’s a grown-up story for those of us that grew up on tales of the GIs, but it’s in no way inaccessible: indeed, it once again ends the prog on a high. By its very nature, 2000AD is always worth dipping into. It can seem inaccessible to newcomers and drifters, but it never disappoints. Another great prog from the thrill-team!